The ordinary minister of the sacrament is a bishop or priest, and the eucharistic prayer and communion rite with reception of the Body and Blood of Christ by those gathered is the centerpiece of the sacrament. In addition to the priest, deacons too are ministers distribution of the sacrament, usually distributing the Blood of Christ. 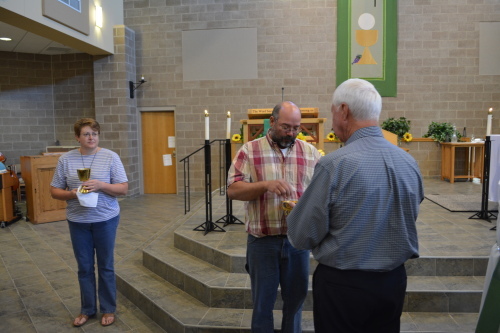 Most parishes also allow lay women and men to serve as extraordinary ministers of Holy Communion, to commissioned to facilitate reception of Communion in an easier way. To become a Eucharistic Minister at St John the Apostle we ask that you participate in one of our training sessions.